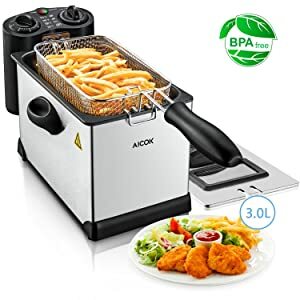 When you have the best home deep fryer you can make a batch of French fries, crispy chicken, deep fried fish, seafood such as coconut shrimp, Japanese tempura, donuts, crispy coated veggies, and many more delicious foods for your family, friends, and special occasions. The foods will be crusty, juicy, and tender inside with its original flavor. You want your foods to always be light and crispy never greasy, heavy, and doughy. The cooking oil stays boiling hot and the fryers maintain a steady temperature to keep it that way with its heating element. You want the food to cook consistently. 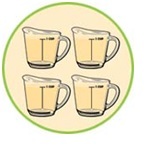 Remember however, that when you immerse raw or cold foods into the container of hot oil, the temperature will drop a bit, but quickly go back the initial temperature. A deep fryer might be called a deep fat fryer, a frier, or fryolator. Will a knob work just as well? Do you want dishwasher safe parts? Do you want automatic oil filtration with automatic oil drainage? Do you want a timer? Do you want a lid to see what’s cooking? Do you want a fryer that is professional or traditional? Do you want illuminating lights and buzzer when food is done? 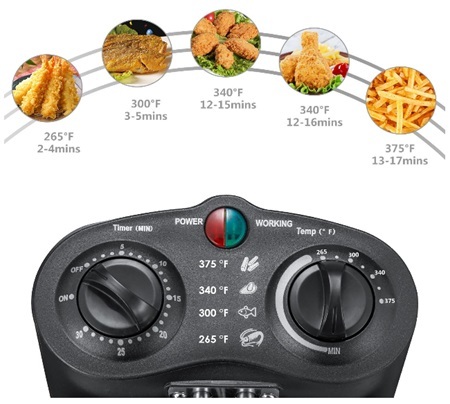 Read the reviews below that will discuss those features for the perfect electric air fryer for your home use or to use in professional and commercial settings, such as snack bars, concession stands, diners, canteens, buffets, self-service restaurants, and cafeterias. The T-fal® deep fryer model FR8000 has a stainless-steel basket holding 2.50 pounds of food. See it on Amazon.com® at an affordable price. With the basket made of stainless-steel, it can go into the dishwasher, whereas aluminum material will corrode over time and lose its shine to then leach into your food. A smaller version is available at only 1.2 liters. The tank holds 3.5 liters (3.7 quarts) of oil that heats up super-hot with the 1700-Watts of power. It uses an advanced oil system temperature control to seal in the foods goodness with a crispy exterior the way you like it. Make crispy onion rings, French fries, all that satisfy your taste buds. The interior bowl is coated with stainless-steel and is removeable, it has 2 carrying handles that are cool to touch, non-slip feet, an indicator light, and it has a cool zone. The filter is metal, the lid is see-through, the on/off switch is easy to use on the front plastic control panel, but there is no digital timer and it will be hot if you touch it so be careful using mitts or pot holders. The light on the bottom comes on to tell you the oil is hot and ready. The parts are dishwasher safe. The reservoir that holds the oil with the heating element lifts out of the unit making it a breeze to clean. 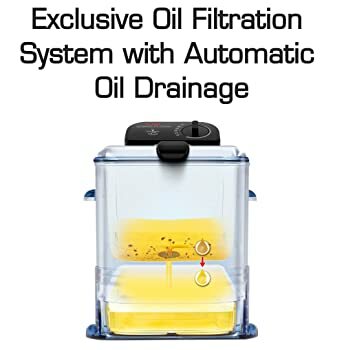 This product has an oil filtration system that automatically drains and filters oil to use again. This system makes this fryer one of the best deep fryers offered. Leave the container in when cooking to save the oil into the container. Don’t keep the sealed plastic container on your countertop; put it into the fridge or it will turn rancid. If the previously used oil smokes or foams, toss it out. The heating element is immersed and recovers the oil temperature (about 374-degrees F.) quickly when you add cold foods. The basket has 2 positions: to sit in the oil, and to sit at the top edge side to drain oil off your food. Use unsaturated oils for more healthy cooking. You cannot use solid fat such as Crisco® or lard; it must be oil! Solid fats will not pass through the filtration system and will clog the parts. You can use canola, corn, safflower, sesame, coconut, peanut, if not allergic to it, and other flavorful healthy oils. Be sure to see what your instructions suggest you use. Plug the UL® listed cord into a USA 110/120-Volt, 50/60 Hz into the wall outlet. It is 1700-Watts. The electric deep fryer plug connecting to the unit is magnetic offering a quick release if someone yanks on the cord. The dimensions are 13.7- x 18.3-inches tall x 14.8-inches and weighs 12.4-pounds. Gift wrapping is available for those you love. It comes with a User’s Manual and a Limited Lifetime Warranty. It is made in China. T-fal® FR8000 Ultimate EZ Clean Deep Fryer Review video. The Cuisinart® stainless-steel electric deep fryer using 1800-Watts of power heats the oil to 374-degrees F. just what you need for frying anything. The immersion-type heating element for model number CDF-200 heats up quickly and recovers fast after adding cold foods. It is removable for hand washing. The see-through lid lets you see what’s cooking. The green light tells you the fryer is on and the red light tells you the oil is hot and ready for your food. It has a timer and it will buzz when the food is done. Do not use solid fat such as Crisco® or lard; it must be oil! Solid fats will not pass through the filtration system and will clog the parts. You can use canola, corn, safflower, sesame, coconut, and peanut oil if not allergic to it, and other flavorful healthy oils. There are no filters, so you drain the oil out at the top lip through cheesecloth and store in the fridge until the next time you want to deep fry. This unit does not automatically drain and catch the oil in a plastic container; it is manual—you do it. Plug the UL® listed 30-inch, 3-prong grounded cord into a USA 110/120-Volt, 50/60 Hz into the wall outlet. It cannot be used with a converter because of the high wattage. It is 1800-Watts at 15-Amps. The manufacturer specifically warns not to use it with 220/240-Volt converters. 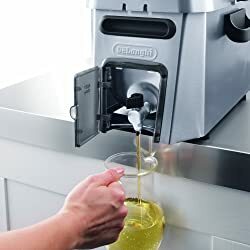 The plug connecting to the unit is magnetic offering a quick release if someone yanks on the cord, a safety feature to make sure yanking on the chord does not move the hot container of oil and accidentally have it come flying off the counter and burning someone like a toddler. The dimensions are 18.5-inches deep x 12.8-inches wide x 12.8-inches tall, 1.68-cubic feet, and weighs 12.8-pounds. The basket size is 10- x 8.25- x 2.75-inches. Gift wrapping is available for those you love. It comes with a User’s Manual and a Limited 1-year Warranty. It is made in China. Cuisinart® Deep Fryer Demo video. 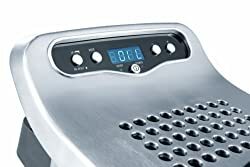 The Secura 1700-Watt stainless-steel 3 fry baskets electric deep fryer with timer and a free extra odor filter is yours for an inexpensive amount on Amazon.com®. You can use 1 of the 2 baskets for French fries and the other one for fish both cooking at the same time. Use the large basket for larger amounts of food. The immersion heating element is inside the oil at the bottom. The tank is removable for easy cleaning. The heat adjusts from 250- to 375-degrees F. The lid should always be closed when cooking to avoid splatters and getting hot oil in your eyes. With the window in the lids you can see through, you can always check up on what’s cooking. The automatic timer can be set up to 60-minutes to shut down automatically. You will have a ‘ready’ to use light. The housing and inside are stainless-steel and the activated filter will reduce those fishy odors. It does not have a hose or dispenser to remove oil; you will do that yourself. Attaching the 3 handles to the 3 baskets can be difficult. The control box assembly and heating element is attached to each other, so when lifting out the control box the heating element will come out with it. Plug the UL® listed 3-prong grounded cord into a USA 110/120-Volt, 50/60 Hz into the wall outlet. It cannot be used with a converter because of the high wattage. It is 1700-Watts. The manufacturer specifically warns not to use it with 220/240-Volt converters. The plug is magnetic to safely fall away to avoid accidental spilling. The dimensions are 17- x 16.5- x 11-inches, weighs about 12-pounds, and is ETL listed. The large basket is 8.5- x 10.75-inches and the small baskets are 5.5- x 8-inches. The DéLonghi® dual zone stainless-steel electric deep fryer model number D34528DZ has two zones of heating and to remain cool to keep food frying the way you like it with no singeing or charring. All of these cool features are available for you at a reasonable price on Amazon.com®. The frying basket is included and dishwasher safe. Holding 3-pounds of food using up to 4.2 quarts of oil you can feed your family or guests with plenty of crispy and crunchy hot wings or chicken breasts. The magnetized cord removes, and an indicator light is on the programmable digital control panel. The handles are cool to touch with 4 rubberized feet for stability. 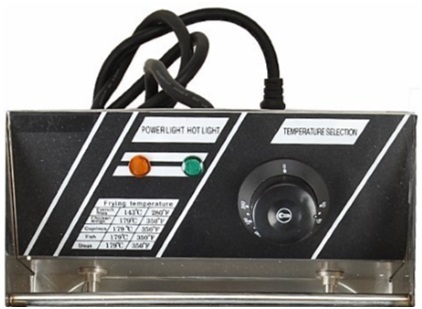 The LED-lit digital control panel is easy to see and read and is adjustable from 300- to 370-degrees F. to prevent over frying with its timer. The temperature will usually get to 374-degrees F. the optimum temperature used by deep fryers. You will see what you’re cooking looking through the lid that must be kept closed to avoid splattering hot oil and burning you. The lid, bowl, and frying basket can be put in the dishwasher to clean. With the removable heating element for cleaning, this is what cooks your food crispy brown and tender inside. 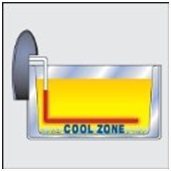 Located under the heating element is the cool zone to keep your food from burning and scorching. This gives you the results you use this fryer for—crispness, crunchiness, and tender or crisp-tender vegetables inside. Odors are decreased and the oil stays cleaner longer with the stainless-steel mesh filter. Another permanent and enduring filter is inside the stainless-steel lid. Operating this deep fryer is safe and easy. The unit has a condensation shield keeping hot oil from dripping on the cord connection at the bottom of the appliance. The cord is magnetic not a plug-into-the-unit type, another safety feature if the fryer should fall over keeping others from being scalded with boiling hot oil. The dimensions are 10.83-inches tall x 17.32-inches wide x 10.63-inches front to back. It weighs only 11-pounds. The basket measures 6-1/4-inches wide x 9-1/4-inches long x 5-inches deep. Plug the UL® listed 30-inch, 3-prong grounded cord into a USA 110/120-Volt, 50/60 Hz wall outlet. It cannot be used with a converter because of the high wattage. It is 1500-Watts. Do not use it with 220/240-Volt converters. 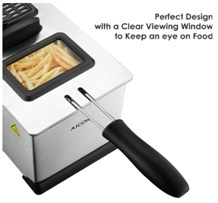 TOP DéLonghi® D34528DZ Dual Zone Deep Fryer Features video. The Flexzion electric deep fryer is huge with double stainless-steel baskets for professional and commercial kitchens and home users too with a large family. The power is 5000-Watts for both tanks and 2500-Watts for each tank and should not have any other electrical appliances plugged into the outlet at the same time and the plugs need to be in separate wall receptacles. For an economical price on Amazon.com®, this unit can’t be outclassed being 2-sided. Each side is 6 liters (6.3 quarts). The unit is heavy duty made of stainless-steel with 2 power plugs to use both sides at one time or a single side you won’t plug in if not used. The handles are an excellent quality plastic that stay cooler. With this unit, you can fry different foods such as chicken, egg rolls, jalapeno poppers, and can be used in supermarkets, snack bars, fast food arenas, home, and any business such as schools. The control panel is analog, not digital with a knob to select the temperature you want. The power light is red and the ready and hot light is green. The cord plugs into the top toward the back of the fryer. Each cooking side has its own controls, power plugs, and baskets. Unknown thickness of the stainless steel (such as superior quality of 18/10) and the feet are 3/4-inch off the counter top surface. The residue plates filter out food scraps and particles. The oil pan is removable for cleaning the unit easily. Put the stainless-steel parts in the dishwasher, but not the housing; wipe it down with warm soapy detergent then rinse and dry. The overall dimensions are 22-3/4- x 17-1/4- x 12-inches. The tank measures 12-3/4- x 10-1/2- x 5-3/4-inches. The frying basket dimensions are 7-1/4- x 8-1/4- x 4-1/4-inches with the basket handle length of 9-1/2-inches. Plug the UL® listed 59-inch (4.9-feet), 3-prong grounded cord into a USA 110/120-Volt, 50/60 Hz into the wall outlet. It cannot be used with a converter because of the high wattage. It is 2500-Watts for each side totaling 5000-Watts when both sides are used. Each side needs to be on its own 20-Amp circuit breaker. Do not use it with 220/240-Volt converters. The temperature control runs from 248- to 392-degrees F. (122-200-degrees C.). Gift wrapping is available for those you love. 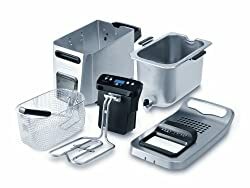 It comes with 1 each 2-sided deep fryer, 2 stainless-steel baskets, 2 stainless-steel lid covers, 2 stainless-steel residue plates, and a User’s Manual. The author’s first language is not English but you will figure it out. Warranty information is not available. It is made in China. The Aicok, item model number DF-036, is a stainless-steel housing electric fryer with a stainless-steel basket, the type of metal that home cooks love best as well as professional chefs and commercial cooks. 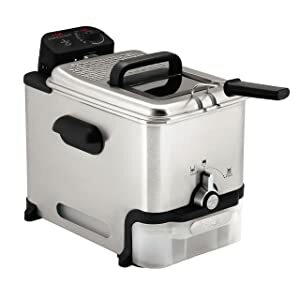 It is affordable for all buyers on Amazon.com®, a best electric deep fryer. This unit can be used in supermarkets, snack bars, fast food courts, food carts, and any business such as schools and cafeterias. 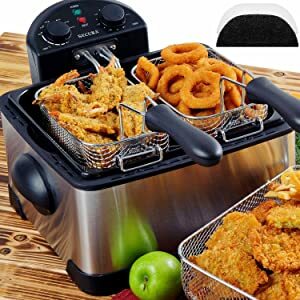 Deep fry your shrimp, chicken, French fries, sweet potato fries, onion rings, vegetables, egg rolls, jalapeño poppers (recipe video below), and more with this powerful fryer. Its temperature and time is controlled by you with a nicely appointed control panel on top. The power for the heating element is 1700-Watts. 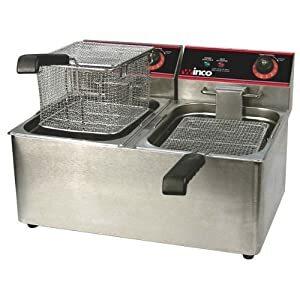 This gets your food done quickly and the filter gets your food finished dry and not soaked up with grease perfectly crispy brown and tender juicy inside. With the snugly fitting lid, the oil will not splash all over your kitchen. The window on the lids lets you see in to observe how your food is cooking never needing to remove the lid. The black louvered square on top is the filter that is washable. Your hands will not be hot with the cool-to-touch handle and the basket and oil container are dishwasher safe. The housing must be wiped down when it’s cool and never go into the dishwasher that will destroy the electrical components. The rubber feet keep the fryer from slipping and the cord can be stored in the back of the base out of sight. It attaches to the unit with a magnet. 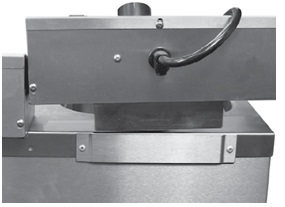 There are 2 lights indicating when the power is on and when the unit is hot and the fryer is CETL certified. It’s best not to use butter, margarine, or olive oil because they smoke even at low temperatures. The best oils are safflower, peanut, and corn. Fried foods cook so quickly you’ll be ready to eat before you set the table. Set the oil temperature range from 265- to 375-degrees F.
The dimensions are 7-inches tall x 12.2 inches wide x 6.3-inches deep. It weighs 6-pounds empty. The basket is 9.45- x 5.2-x 3.15-inches and holds 2.5-liters (2.64-quarts). Plug the UL® listed 2-foot 2-prong cord into a North American 110/120-Volt, 50/60 Hz wall outlet. In other countries you will need to buy a 220/240-Volt adapter to use it. It comes with an Instruction Manual but no recipes. You will have a 30-day money back guarantee, 2-year Warranty, and lifetime technical support. It is made in China. Homemade Hispanic Jalapeño Poppers recipe. Use the Aicock electric deep fryer and not a skillet or pan like the lady, Mitisha, is using. Ingredients and how-to video. These are delicious! Aicok Electric Deep Fryer, unboxing review frying shrimp video. 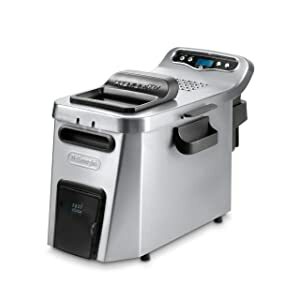 The YesComUSA commercial electric deep fryer is great for business, commercial, and home use. Use it at concession stands, snack bars, sporting events kitchens, schools, restaurants, fast food stands, and parties in your own kitchen. It will make the best crispy Buffalo wings, chicken, dumplings, egg rolls, shrimp rolls, mozzarella sticks, corn dogs, seafood, jalapeno poppers, funnel cakes, donuts, and more. 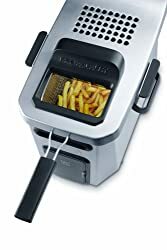 You can’t go wrong with the model number 26FRY001-D5000 at the affordable price on Amazon.com®. The 2 tanks at 2500-Watts each (5000-Watts total) are made of heavy-duty stainless-steel with 2 thermostats for individual controls. Cover the cooking area with the included lids to avoid splashing hot oil that will scald you. The residue plates filter out the sediment, and food remains. Each tank holds 6 liters for a total of 12 liters for the fryer. Be sure if you only use 1 tank that the other one is not plugged in. The overall dimensions are 23- x 18- x 12-inches. The tank measures 12-3/4- x 10-1/2- x 5-3/4-inches. 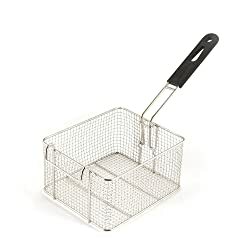 The frying basket dimensions are 7-1/4- x 8-1/4- x 4-1/4-inches. It weighs 18-pounds. The handles are 9-1/2-Inches long. 5000 Watts = 45.45 Amps (Amps = Watts / Volts). We know the Voltage is 110 and we know the Wattage is 5000. Divide 45.45 Watts by 2 to get the Amps for each tank, equals 22.73 Amps. The temperature control runs from 140- to 392-degrees F. It does not have a drain. Each of the oil holding tanks are completely removeable and can be poured out saving the oil for another time. 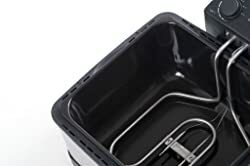 It comes with 1 each 2-sided deep fryer, 2 stainless-steel baskets, 2 stainless-steel lid covers, 2 stainless-steel residue plates, and a User’s Manual. Amazon offers a 30-day return policy and YesComUSA provides a 3-month Warranty. It is made in China. Hamilton Beach® has been making home appliances since 1910 in the USA. Their electric deep fryer model number 35034 is an excellent unit on Amazon.com® for an affordable price. This home fryer comes with 3 baskets: 2 small and 1 larger for bigger amounts of food at one time. The 2 small baskets hold 6 cups each and the 1 larger basket holds 12 cups of food and 6 quarts of oil. Double baskets give you the ability to cook 2 different foods at the same time. 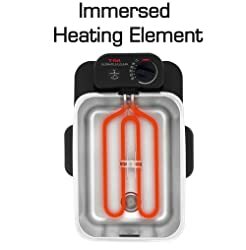 The immersed heating elements heat fast and cook fast. The unit is easy to put together, use and clean. 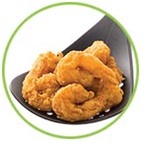 With the double baskets with hooks, it is easy to drain your food of residual oil. Food can be lowered into hot oil and lifted out while the lid is closed for splatter-free frying. 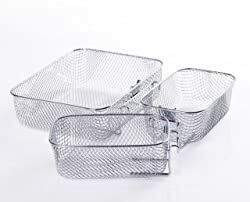 The fryer baskets are stainless-steel and dishwasher safe. The power light is red and the power ready light is green with an adjustable timer, temperature control, and beep sound when your food is ready. 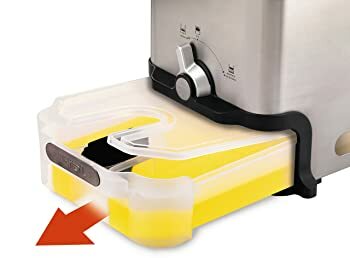 You can see through the lid and keep it closed to keep from having hot oil splatters and burns. The magnetic cord breaks away for safety. The overall dimensions are 10.5-inches high x 13.2-inches wide x 14.5-inches deep. The big basket is 10.5-inches long x 9-inches wide x 3-inches deep. It weighs about 12-pounds. Plug the UL® listed 3-prong grounded cord into a USA 110/120-Volt, 50/60 Hz into the wall outlet. It cannot be used with a converter because of the high wattage. It is 1800-Watts and should be plugged into a 20-Amp circuit breaker. Do not use it with 220/240-Volt converters. Gift wrapping is available for those you love. It comes with a User’s Manual and a 1-year Limited Warranty. It is made in China. The Winco®/DWL Industries Company provides appliances and supplies for the food services industries. 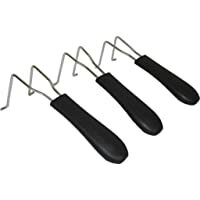 The model EFT-32 on Amazon.com® is reasonably price and is perfect for high-volume deep frying. 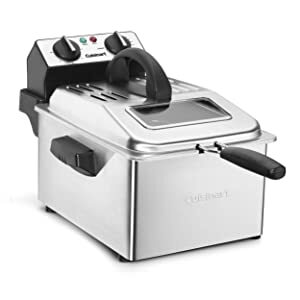 It is a countertop electric twin well deep fryer holding 32-pounds of oil (16-pounds for each well). It’s ideal for those in the restaurant, concession stand, snack bar business. It is ideal for large families at home with all the kiddos and their friends, especially hungry teenagers. It will cook up to 10-pounds of chicken and the 2 baskets do not transfer flavors. Independent temperature control lets you cook each basket of food at different temperatures. The fry wells are stainless-steel and very easy to clean along with the covers. The stainless-steel fry wells and power heads are removable for easy cleaning and reinstallation. The fry baskets fit well and have safety handles. There are no drain plugs or timers. The wells are 9.45-inches wide by 7.48-inches deep x 5.51-inches long and weigh about 35-pounds. Plug the UL® listed 3-prong grounded cord into a USA 110/120-Volt, 50/60 Hz into the wall outlet. It cannot be used with a converter because of the high wattage. It is 1750-Watts, 15-Amps, single-phase, and should be plugged into a 20-Amp circuit breaker. Do not use it with 220/240-Volt converters. That is for each side! The power cord is not hard-wired and is removable. The deep fryer is ETL-Sanitation, cETLus certified. Gift wrapping is available for those you love. It comes with a User’s Manual in English, Spanish, and French with a 1-year Limited Warranty. It is made in China. The National Presto® Industries, Inc. has been making the best home appliances for years. It was started in 1905 in Wisconsin, USA. 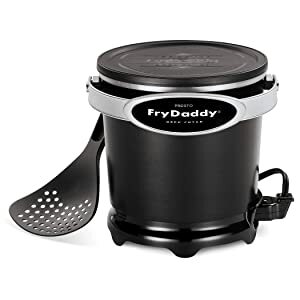 My grandmother and mother owned Presto® pressure cookers and now I own the FryDaddy® deep fryer that I’m crazy about! Presto® made the best electric coffee pot and electric skillets ever made and I owned them too. 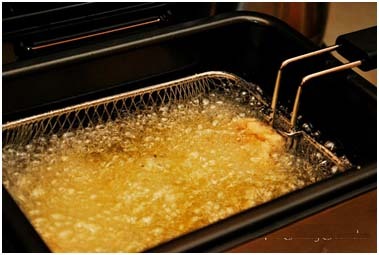 I have made the best coconut shrimp and tempura with this fryer using little oil. The model number 05420 is a popular model on Amazon.com®, and is affordable made of aluminum and plastic in black and silver colors. The one drawback is that the lid is plastic and will melt if you put in on the fryer while cooking or when hot. However, the problem is solved with a splatter guard or a lid from any existing pot. For the price, the lid is not an issue. There is no basket to clean because none is needed. Use the scoop included that drains the oil off and put your food on paper towels for a few minutes then serve to delicious perfection. The inside is non-stick and is not coated with porcelain/ceramic so that it’s easy to clean by hand. Do not put in the dishwasher because the electrical components will be ruined. The lid snaps on fitting snuggly. Store your oil in the deep fryer on your counter, or put the oil in a container and store the unit in a cupboard until next time. The cord is removable and can store it inside the pot then cover with the lid. 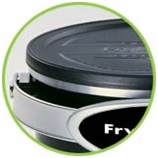 You will have no odors or spills with the secure fitting lid. There are no controls to set and no timer. It reaches the perfect temperature every time for every food you cook with its built-in thermostat. It will heat to 374-degrees F. in about 6 minutes. Use a candy thermometer clipped to the side to see the temperature. It has a carrying handle and sits off the counter top with feet. The dimensions are 7-inches in diameter at the bottom and 6-inches diameter at the top and weighs only 3.02-pounds. The width is 8.13-inches, depth is 8.38-inches, and the height is 7.38-inches. Plug the 30-inch UL® listed 3-prong grounded cord into a USA 110/120-Volt, 50/60 Hz into the wall outlet. It cannot be used with a converter because of the high wattage. It is 1200-Watts. Do not use it with 220/240-Volt converters. The power cord is not hard-wired and is removable. The deep fryer is built to North American Electrical Standards. Gift wrapping is available for those you love. It comes with a User’s Manual and a 1-year Limited Warranty. It is designed in the USA and made in China. Presto® FryDaddy® Electric Deep Fryer video. 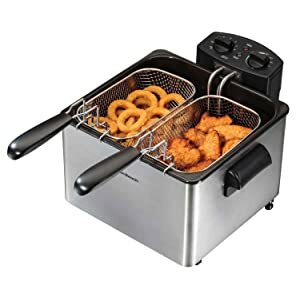 For double basket fryers: Use 1 dedicated 20 Amp circuit with a single outlet for each fryer head. 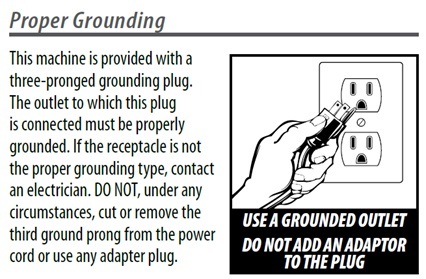 Do not plug both cords into the same wall receptacle. Always unplug both cords and never plug in the cord for the side not being used. As required by federal regulations, most cords are under 30-inches in length, and should not be used with an extension cord. Stainless-steel uses no coatings for home deep fryers. Do not plug in the cord until you’ve put the oil into the unit. Make sure the oil has completely cooled for several hours before straining and pouring it out. The best oil for frying is peanut oil. However, you can use canola, corn, or vegetable oil. Olive oil for frying is not recommended. 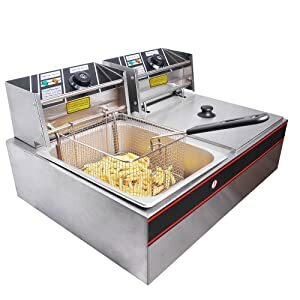 Clean deep fryers when the unit is cold and unplugged. Most parts can be put in the dishwasher but not the unit with the electrical components. Always read your User’s Manual. 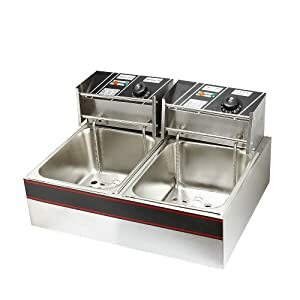 Dual fry pots are rated at 2500 watts each. You cannot plug both in on the same circuit. The circuit also must be larger than 15 Amp. 5000 Watts = 45.45 Amps (Amps = Watts / Volts). We know the Voltage is 110 and we know the Wattage is 5000. Divide 45.45 Watts by 2 to get the Amps for each tank, equals 22.73 Amps. To know yours, use this formula with the Watts of your unit. Never clean the fryers with steel wool. Use a damp cloth or sponge dipped in soapy water to clean the unit and wells then rinse and dry thoroughly. The wellscan be filled with water and dish washing liquid, rinsed, then dried. Important: Electrical safety cannot be stressed enough for you and any electrical appliance you own. The electric deep fryers use this type cord plug-in end at the wall receptacle. Whether you buy the single basket or dual baskets, be safe, follow the manufacturer’s instructions and enjoy healthy delicious crispy foods. Happy shopping, cooking, and eating!